Lowa Cevedale Pro GTX delivers high levels of comfort, according to many expert reviewers and regular consumers. This mountaineering footwear has commendable ankle support, based on a number of reviews. 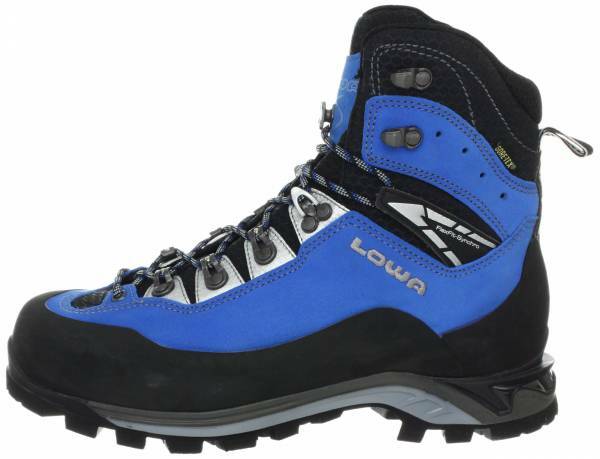 Many experts and Lowa users commended the Cevedale Pro GTX for its lacing system. They especially loved the lower speed hooks for having ball bearings which make forefoot lace adjustments a cinch. This boot helped a handful of wearers stay warm throughout their icy adventures. Some buyers believed that they had a justifiable purchase in the Cevedale Pro GTX. A small percentage of reviewers swore by this boot’s dependable stability over rocky terrain. This mountaineering footgear has a good amount of breathability, according to some wearers. A few Lowa fans applauded the boot’s grip performance on muddy and snowy grounds. The Lowa Cevedale Pro GTX has a surprisingly flexible forefoot zone, based on a couple of positive user reviews. An expert couldn’t help but admire the boot’s outstanding waterproofing performance. Its super-protective upper, thanks in no small part to its heavy-duty rubber rand, was praised by a professional YouTuber. A couple of female mountaineers weren’t amused with the Cevedale Pro GTX’s inconsistent sizing. Both women had to reorder a half size smaller just to get the right fit. The Lowa Cevedale Pro GTX is celebrated for its outstandingly comfortable inner construction, excellent ankle support and tough build. This waterproof yet breathable boot offers quality traction and stability on tricky terrain without sacrificing flexibility. It provides warmth in cold temperatures and sports an ingenious lace-up system. But it’s not all nice and sunny in the Cevedale Pro GTX camp as complaints about the women’s version’s sizing put a dent in the boot’s almost perfect track record. By now, if you've watched our Facebook videos or Youtube videos, you know that we're fans of lightweight mountaineering boots, and in this instance, it's no different. They've never hurt, they've never felt funny and they've been amazing from day one. The upper is a mix of synthetic and leather plus a big rubber rand that fully encloses the boot, and this all looks more than capable of withstanding plenty of abuse. The most supportive boot we tested, these stiff, crampon-compatible boots take the sting out of 70-pound loads and steep, rocky slopes. The Cevedale Pro GTX is a mountaineering gear made sturdy by the durable upper, which is a combination of split-grain leather, synthetic fabrics, and rubber. It has a Gore-Tex lining which makes the boot waterproof. This version has received quite a notable upgrade in its lacing system compared with its predecessor. Gone are the synthetic lace loops securing the lower part of the boot; in their place are a set of roller eyelets—metallic lace loops with ball bearings that act as conveyor wheels which make lacing up convenient. This closure system also features the I-Lock. This Lowa-patented device allows for a separate lacing configuration from the ankle up. What gives wearers stability and shock absorption is the boot’s thick midsole which is made of dual-density rubber. It has a contoured arch, giving the boot a heel brake, as well as an updated heel shelf, serving as a crampon attach point. The Cevedale Pro GTX has a grippy outsole powered by Vibram. This hardy rubber layer has aggressive lugs which allow mountaineers to securely gain footing on snowy or rocky terrain. The Lowa Cevedale Pro GTX is a technical mountaineering boot for both men and women. It comes in standard US sizes and medium width. Giving wearers a snug and personalized fit is the boot’s lacing system which allows for multiple pressure configurations, thanks to its roller eyelets, I-Lock cam, and ankle collar speed hooks. The gusseted tongue and ankle cuff are also padded for extra comfort fit. When it comes to providing and maintaining surface traction in freezing temperatures, the Cevedale Pro GTX relies on its Vibram Dolent outsole. This resolable, single-piece rubber component is based on the Vibram Mont compound, a blend of elastomers that are characterized by durability and low-temperature resilience. This outsole also features high-profile lugs which help mountaineers secure their footing, whether on rocky slopes or snowy ravines. The lugs on the outsole’s heel are especially prominent to give the boot a heel brake—a boot feature that aids mountaineers during descents. The Cevedale Pro GTX has a dual-density DuraPU midsole with a heel groove for attaching the crampon. It is the primary source of cushioning and shock absorption. This rubber construction gives the boot the ability to withstand the wearer's weight and maintain a level of stability on tricky terrain. Within the midsole’s confines is an insole called Hard Shank. It is specifically for granting support to mountaineers carrying a light load. The Lowa Cevedale Pro GTX’s midsole also tapers towards the front zone, a design choice that gives the footwear a toe rocker. A stiff-soled boot with a rockered toe aids mountaineers during toe-offs and makes transitions on flatter grounds relatively bearable. Helping the midsole give users a comfortable mountaineering experience is a Lowa-patented insole called Climate Control Footbed. This removable footbed is designed to provide insulation in cold conditions and air circulation in warmer environments. Lowa’s Cevedale Pro GTX is crafted to provide support and protection with its layered upper. It is a fusion of breathable man-made textiles and full-grain leather. The base of the upper has a 360-degree bump and abrasion protection, thanks to its rubber rand coverage. The boot has a gusseted tongue which walls of debris with its persistent tongue-to-upper construction. Protection from water and other wet elements, on the other hand, is handled by the Gore-Tex waterproof liner which is engineered within the upper. The boot’s closure system promises a quick and customized lockdown, not only because of its roller eyelets and speed hooks, but also due to the stud on the tongue with which the user’s desired ankle pressure may be applied. FlexFit Synchro—a registered technology by Lowa—also finds its way to the Cevedale Pro GTX. It allows the shaft of the boot to move in-sync with the wearer’s lower leg to improve walking comfort. The Lowa Cevedale Pro GTX is compatible with C2 - hybrid (semi-automatic) crampons.